GW men’s basketball is back. Two opinions writers were in the stands last Friday as the Colonials took on Grambling State. Suddenly, GW basketball feels real. At the home opener last weekend, I almost couldn’t believe my eyes: The Smith Center was packed, and people were excited. Students wore their free Colonial Army shirts, waved pom-poms and even sang the fight song. The Smith Center felt different, too. New event staff had been hired, everything had shiny new labels and the entire experience felt legitimate – like a real college basketball franchise. My freshman year, I went to my fair share of basketball games and vividly remember near-empty stands each time. I would drag my friends along, hoping for a big crowd and a competitive game, only to find that not many people cared much about our basketball team. Even last year, I sat in nearly vacant stands once or twice at the beginning of the season. The Colonial Army cheered and the dance team performed, but that was it. The rest of the campus was indifferent until about halfway through the season, when it started to look like the team had a chance of heading to the NCAA tournament. This year, everything feels different – and we should all be enthusiastic about the possibilities of success and postseason play that this season brings. Since the team made its March Madness run last year, campus interest in GW basketball has seemingly exploded. I’ve gone from being one of the team’s few fans to one of many – and that’s a great feeling. In my small hometown, supporting athletics – mostly football – is second nature. No one makes Friday night plans during the fall because it’s assumed students will be at the game, bundled up and sporting our high school’s blue and gold colors. I didn’t initially find the same community here at GW, and though I knew that would happen when I put down my deposit, a small part of me hoped it would change – and it has. The feeling in the Smith Center last Friday might be difficult to understand if you weren’t there, or if you didn’t go to past men’s basketball games when there were more players than fans. But when the updated NCAA tournament banner was revealed and the players took the court, there was an unexplainable electricity in the student section. People genuinely cared, and I could feel it. But now, the players and the fans own the season. It’s ours to brag about and enjoy. 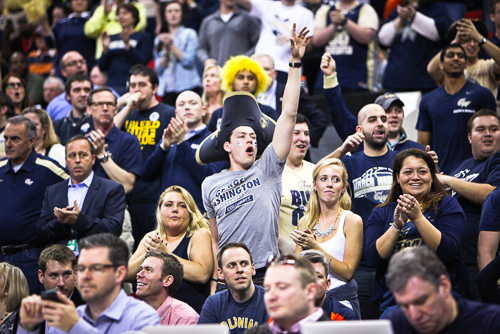 Having basketball games is no longer just a box for GW or its students to check off – it’s something to which we can look forward. Our student body isn’t one that’s known for caring about sports. And yet, as our relatively unknown program gets ready to make a name for itself, it feels like students are standing behind it. More games will be broadcast nationally, people finally know the fight song and everyone has their fingers crossed for a spot on the March Madness bracket. So before the conference season gets underway, take a look at the schedule. Come to a game, and see what I mean when I talk about the crowd’s electricity. You’ll feel it, and then you’ll be excited about GW basketball, too. Last Friday, I went to my first basketball game. It was actually my first-ever college sporting event. The constant cheering, shouting and singing for our school’s team made me feel like a true member of the GW community for the first time. Being an indifferent, verging on painfully apathetic Brit, this school spirit was not something I was used to, but it turned out to be something I enjoyed. Yet something tainted a seemingly great game, ultimately leaving me with a bad taste in my mouth: I was shocked by the way our crowd treated the opposing team. One student who went to the game with me later said she thought those comments were racially charged, and that she was irritated and embarrassed by the way some GW students behaved. Some might argue that students’ negative comments strengthen feelings of unity and belonging: Facing a common “enemy” would, in theory, bring us together. But the other players aren’t our enemies – they’re just the other team. And they have to play the game, just like our players. In reality, these comments and the constant booing simply add a dimension of hostility to an otherwise great atmosphere. We should be cheering on our team, not cutting down others. This kind of behavior not only seemed disrespectful, it also turned out to be unnecessary: GW defeated Grambling State by the team’s largest margin of victory since 1999. Since these comments had no instrumental value in helping our team – which didn’t need a home-court advantage to pull through and win – they can only be described as needlessly offensive. It’s poor sportsmanship to kick the other team when it’s already down. I’m sure some people will probably think I’m taking all this too seriously: After, all it’s just a college basketball game. But decency and respect for others is important in all contexts. Negative comments are insulting to the other players, annoying to those trying to concentrate on the game and ultimately reflect poorly on GW.